Here's a song that's #1 this week on The Ultimate Chart by Maroon 5 featuring Christina Aguilera called "Moves Like Jagger." The song is the first top 10 for the band and is included on their third studio album called Hands All Over. As in all song analysis, we'll look at the song form, the arrangement, the sound and the production. The song has only two chords that keep repeating, but the arrangement outlines the song's sections. The intro and outro are both shortened verses with the signature line over the top. The arrangement for "Moves Like Jagger" is fairly sparse, although in the chorus there's a lot more going on that there seems. The song is really centered around the rhythm guitar and kick drum, but the catchy whistling signature line defines the intro, the end of the choruses and the outro. The 2nd verse is different from the first in that harmony vocals enter at the end of the lines during the last 8 bars, and the chorus is different from the verse in that the rest of the drum kit enters as well as a very subtle synth string sound playing the rhythm and beefing up the section. * The Foundation: Drums and synth bass, especially the kick drum. * The Pad: Harmony background vocals in the bridge. * The Rhythm: The infectious rhythm funk guitar. * The Lead: The lead vocals. * The Fills: The whistling signature line in the chorus and at the end of the verses. The sound of the record is classic dance, complete with an up front of the mix kick drum, synth bass, extra snappy snare drum, and a ton of compression to make it as loud and punchy as possible. The one thing I really like is the ambiance sound of the vocal, which sounds like both a long delay and reverb timed to the track. "Moves Like Jagger" is top 40 dance-oriented music at it's finest. You have a memorable melody, a catchy lyric, a signature lead line, great vocal performances and an arrangement that pulls the listener in. That's pretty good production in my book. Don't be afraid to send me your song requests! Here's an old interview with Buddy Rich from the Today Show. Not many drummers have attained the skill that seemed to come so easy for Buddy even when he was very young, but he was truly a force of nature on stage. I was lucky enough to see him several times, and a number of my friends played with him, so I heard the stories, and saw the dexterity first-hand. As he intimates from this interview, it still would've been fun to see him today even if he was playing in a wheel chair. 1) A great drummer like Buddy can make you appreciate a genre of music you don't particularly love. 2) Don't worry about the past. That was then, no matter how good or bad it was, and now is now. Embrace it. 3) A player is a player, regardless of the genre. A great player "plays what the music calls for." One of the quickest ways to improve the sound of your monitor system is to decouple your speakers from whatever they're sitting on. This can be done with a commercial product like Primacoustic's Recoil Stabilizers as shown on the left, or relatively cheaply with some open cell (closed-cell will work too) neoprene, or even some mouse pads. So why is this so important? When a speaker is sitting directly on a desk, console or speaker stand, the low frequencies radiate through the wood or metal faster than through the air. This means that those frequencies either get to your ear first that way, or you can feel the vibrations before you can hear them. Unless the two occur at exactly the same time, there's some difference in phase, which can result in a subtle yet very real blurring of the sound. As a result, it will be just a little harder to hear your low end distinctly, which makes it more difficult to EQ. 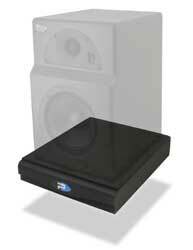 Decoupling those subwoofers from the floor can really help too. While sometimes the coupling with the floor can make your low end feel bigger, it will be a lot clearer and distinct if decoupled. Aurelex even has a product for this called the SubDude HD, although you can probably put together a DIY setup that can work just as well. Regardless of the brand, model and type of speakers that you use, decoupling is a cheap and easy way to improve your sound right away. Give it a try. I was recently turned on to a great Wired post about "The Birth Of The Microphone: How Sound Became Signal." You can read the entire thing at the previous link, but below are a few things that I found especially interesting. 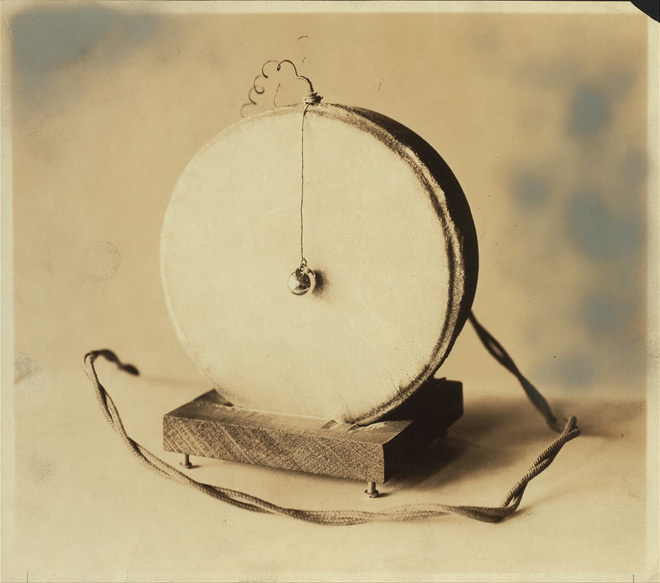 The drum-like device on the left is a carbon-button microphone, patented by Emile Berliner in 1877. It was one of the first ever created and by far the most usable. Berliner is credited with inventing the carbon-button microphone in 1876. Though there were other microphone technologies in existence, Berliner’s design was more robust than the rest (including a liquid-based mic invented by Alexander Graham Bell). Bell himself was so impressed with the carbon-button that he bought the rights from Berliner for $50,000 (1.1 million dollars in today's money), so he could use it in his telephone prototypes. Unfortunately for Berliner, his patent didn’t survive a legal challenge, which resulted in an 1892 ruling by the U.S. Supreme Court ruling that gave the credit to Thomas Edison. In fact, neither Berliner nor Edison could rightfully claim full credit for the carbon-button mic. The idea for it had been around for years before they began their experiments, though it had never been perfected. In certain configurations, carbon-buttons can behave as if they have built-in amplifiers, not only converting sound into voltage but also increasing the strength of that voltage before it leaves the mic. The crude transmitters of the teens and '20s required high-input signals in order to function. Vacuum tubes were new and not in widespread use, and transistors were far in the future. So powerful carbon-buttons were a must. 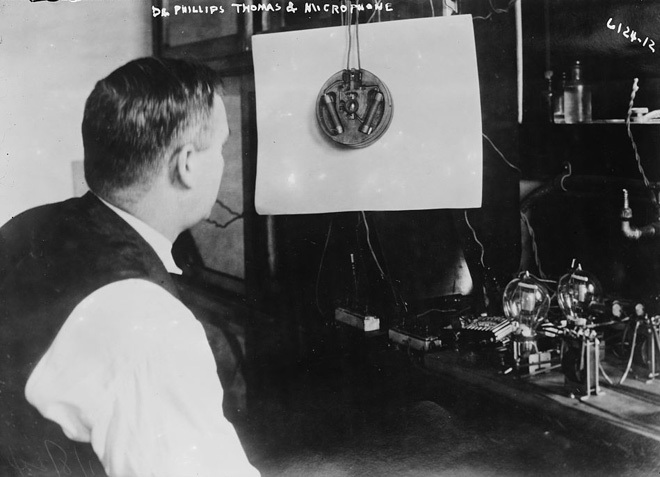 Phillips Thomas invented an “ultra-audible” microphone in the 1920s, while working for Westinghouse Electric. The name derived from Thomas’ claim that the device was sensitive enough to detect vibrations outside the range of human hearing. Popular Science Monthly speculated in April 1924 that Thomas’ microphone could determine “ultra-audible” bug songs not heard by humans into electrical signals and then light, allowing human observers to analyze the sounds even though they couldn’t hear them. 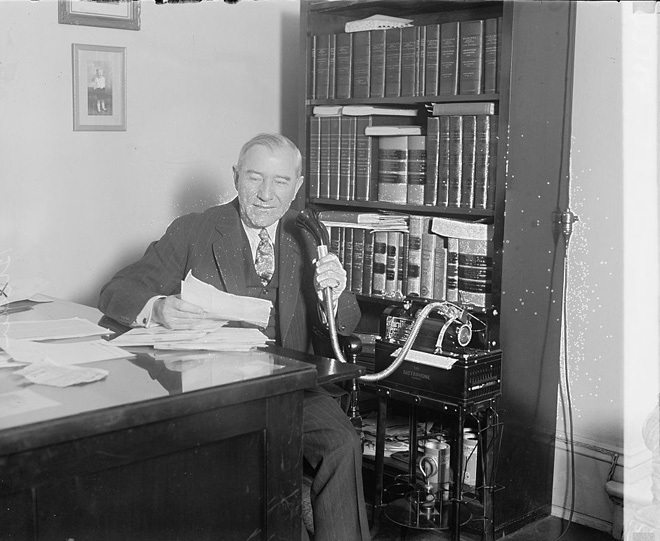 The hookah-like tube connects this anonymous businessman to a dictaphone, the first technology for nonprofessional recording, used primarily in offices to take dictations. Invented by Thomas Edison, the dictaphone uses the same basic principle as a phonograph. Sound vibrates a needle inside the device that cuts a groove into a rotating blank format — in this case a wax cylinder. The cylinder can be played back to reproduce the original sound, and though the quality of audio is horrible, indie bands in search of vintage cred are predicted to release wax-cylinder singles in the near future. Hal Totten, who called games for Chicago’s WMAQ during the 1920s, wears a three-piece suit in Comiskey Park. 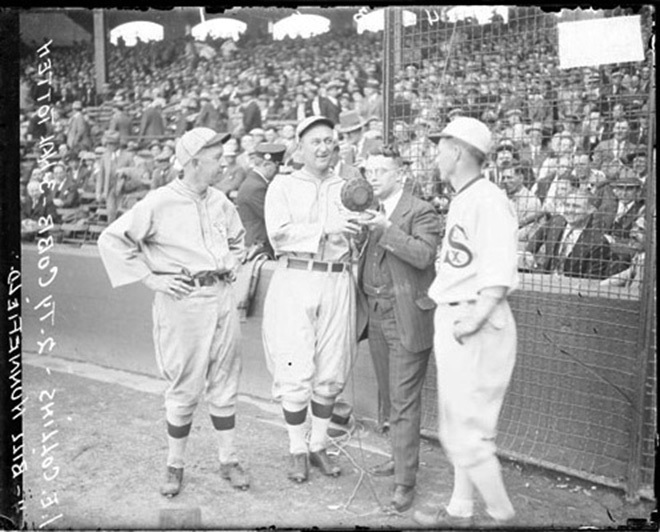 He stands next to Ty Cobb and fellow big-leaguers Eddie Collins and Bill Hunnefield at a game in 1927. The group is speaking into an early carbon-button microphone which served the crucial dual purpose of transmitting sound and amplifying it. The amplification was essential during the first days of broadcasting, because transmitters weren’t sensitive enough to pick up the output of unamplified microphones. 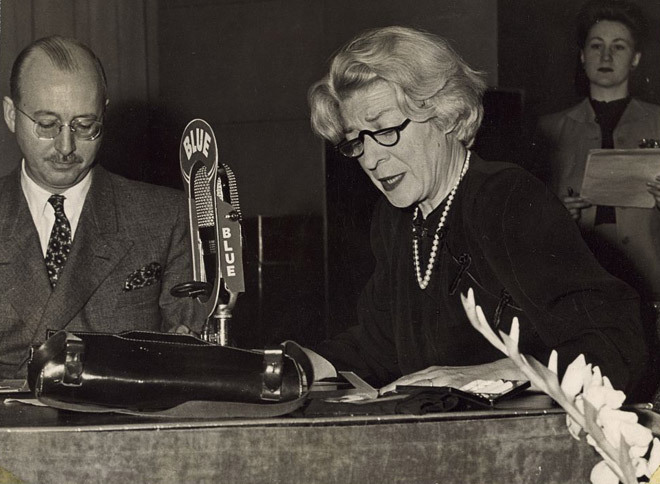 Pioneering journalist Janet Flanner reads for the program "Listen: The Women,” broadcast from Paris shortly after the city was liberated in 1944. She’s speaking into an RCA 77 ribbon microphone, a standard of early broadcasting that has become a favorite of modern recording engineers. 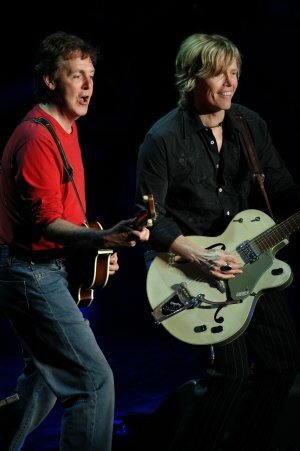 Here's an interview with Paul McCartney guitarist/bassist Brian Ray from my book "How To Make Your Band Sound Great. " In it he explains how the got the job with Sir Paul. As you'll see, sometimes the gig of a lifetime happens in an unexpected way. "At my birthday party my friend Abe (drummer Abe Laboriel Jr.), who toured with me with Mylene Farmer and Johnny Hallyday, told me he was now working with Paul McCartney and they were going on tour but were looking for a guitar player who could play bass. I just put my arm in the air and said, “I’d love a shot at that,” which was way out of my character to do something like that. I’d always gone from gig to gig by word of mouth and I was normally too shy to stick up for myself like that. A couple weeks later I got a call from Paul’s producer David Kahne to come to his office in Hollywood. We just talked music and then he handed me a bass and I played a little while we were just chatting. Then he handed me a guitar and we chatted some more when he finally said, “We’re doing one song at the Super Bowl in 2002 and we’re looking for someone to play bass. Are you into it?” Of course I was into it! He said that they were looking at a couple of other guys but he had a good feeling about me and would put my name forward. The next day I got a call to see if I could be on a plane to new Orleans the day after that to play a song with Paul McCartney! I played the gig and it seemed to have worked out well. I was shaking Paul’s hand at the end where I said, “Thank you. It was a real privilege and if I don’t get to see you again, thank you very much,” when I realized that I couldn’t let go of his hand (laughs), but he invited me back to the bar for a drink with the rest of the band. At the end of the night he was saying his goodbyes to everyone when he said, “Welcome aboard, Brian. Stick with Abe and Rusty (guitar player Rusty Anderson) to show you the ropes and I’ll see you in five weeks.” I couldn’t believe that I was in after only one song! So I just ran home and started woodshedding and cramming. You can read additional excerpts from this book and others at bobbyowsinski.com.